13.10. At The Norwegian Kennel Club Show in Hamar, Multi BIS, BISS Kazar Ural went BOB and Group Winner! 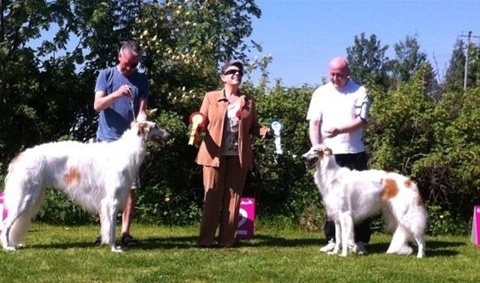 Judges were: Ann Ingram and Leif Ragnar Hjorth. 06.10. Ch Kazar Umba was Best of Breed at Letohallen under Nils Molin, Sweden. 09.10. On August 30. Multi ch Borscana Sonata Artica gave birth to three beautiful puppies after our BIS, BISS, Ch Kazar Ural. 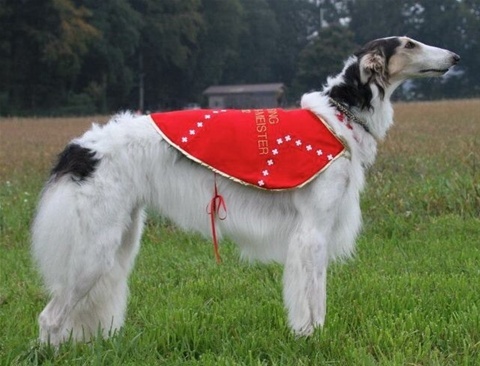 The lovely Milka was Sweden´s top winning borzoi in -09, -10 and -11! Breeders are The Borscana Kennels. 26.08. 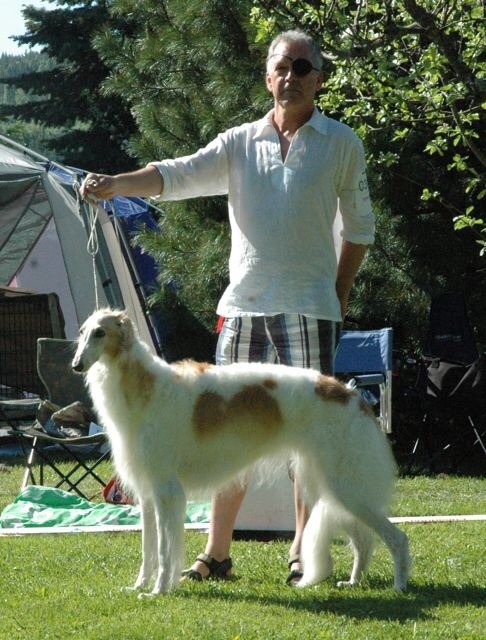 US Ch Kazar Rubine went Best of Breed at The St. Croix Valley K.C., judge Sulie Greendale-Paveza. Owner: Melanie Richards, knl Lythe, US. 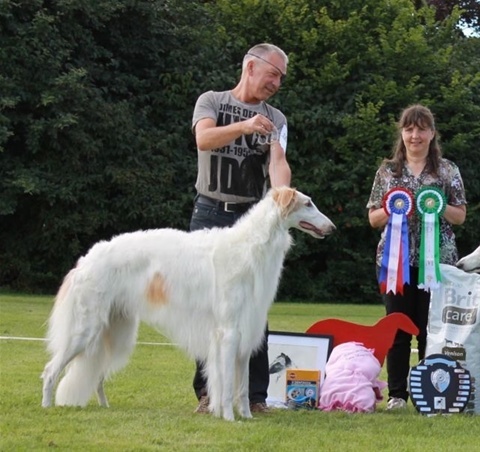 Ali, Ch Kazar Ural have had another amazing show weekend! August 26th Ali went BEST IN SHOW at The Norwegian Sighthound Club of Mid Norway and also BEST IN SHOW at Trondheim Dog Festival!!! Judges: Saija Juutilainen, Ligita Zake and Jochen Eberhardt. Owners: Kazar. 22.08 Yesterday our V-litter turned 4 weeks. 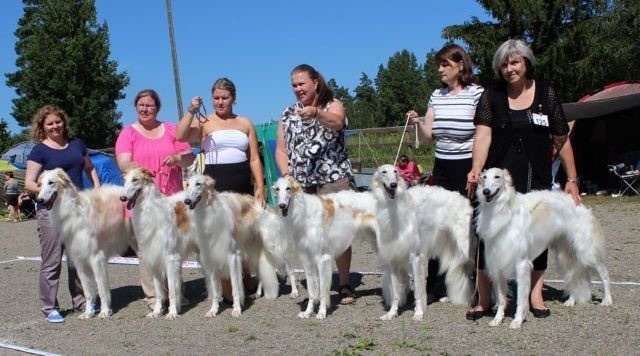 BIS, Nch Kazar Ural went BEST IN SHOW! Owner: Kazar. 11-12.08. 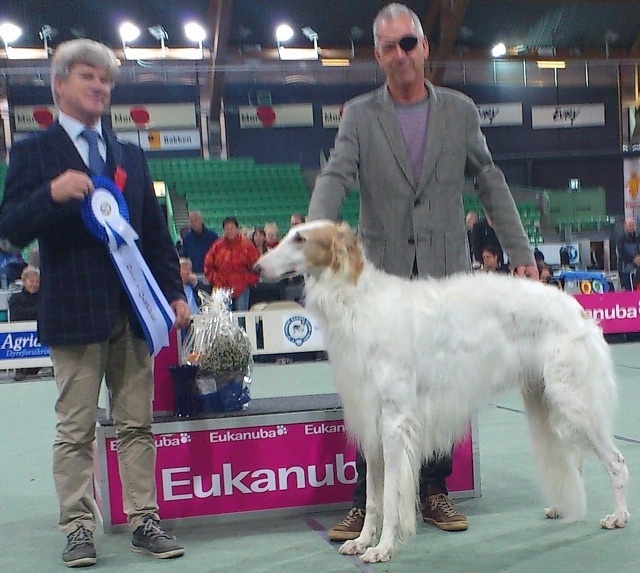 Innsbruch, Austria: International and Swiss ch Kazar Sveta got the CAC both days and became Austrian Champion. Judges were Roland Spörr and Lisbeth Mach. 28.07. 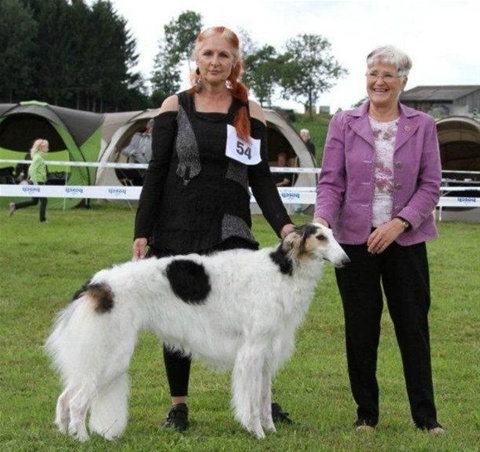 CAC Show in Moss: Ch Kazar Umba went BOB and BOG-2 under judge Henrik Johanson, Sweden. Owner: Kristian Noreng. 28.07. 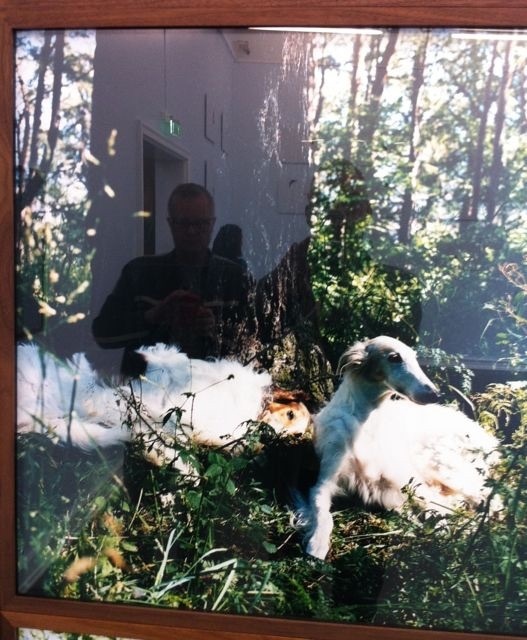 The picture shows Tarijemiran´s F-litter at 16 months at the Finnish borzoi Specialty. They´ve had a tremendous success in the showring already! and finally Frederiza has 3 CACs and 1 CACIB. In addition they have won BOBs, Group and Group placings! 24.07. 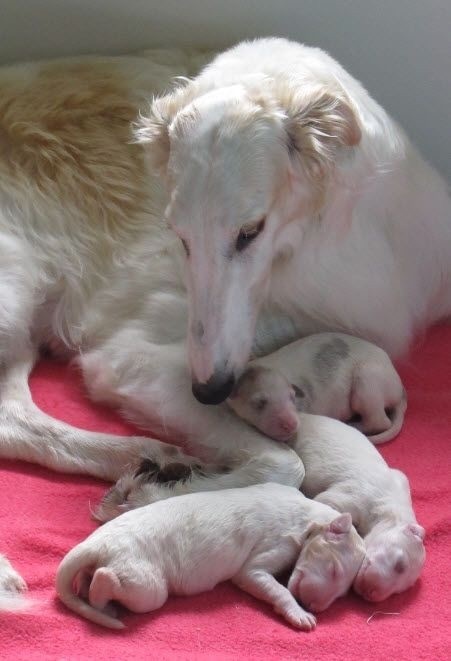 This morning Ch Kazar Slava gave birth to 6 puppies (3+3). 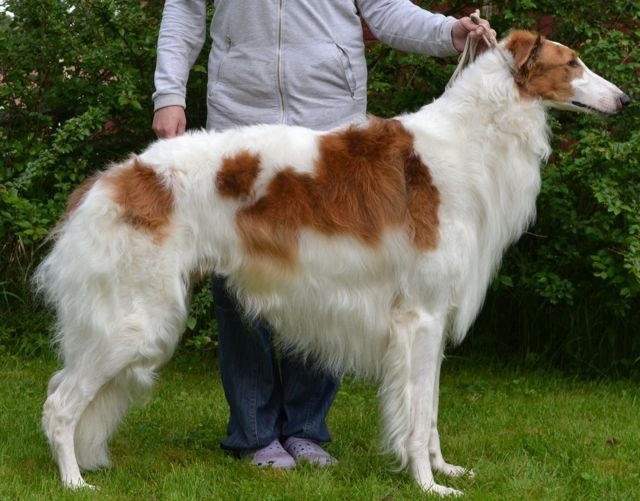 They are all strong and healthy, and coloured white with golden markings. Proud father is BIS Ch Kazar Ural. 15.07. Rifferswil (Switzerland): Ch Kazar Tara went BOB under judge Agneta Kappers, Sweden. Sabella and at Duluth K.C. under Jon Cole. Owner: Melanie Richards, Knl Lythe, U.S.
24.06 Ch Kazar Ural went BOB and BOG-2 today at a CAC show in Oppdal today under judge Lilliane De Ridder-Onghena, Belgium! 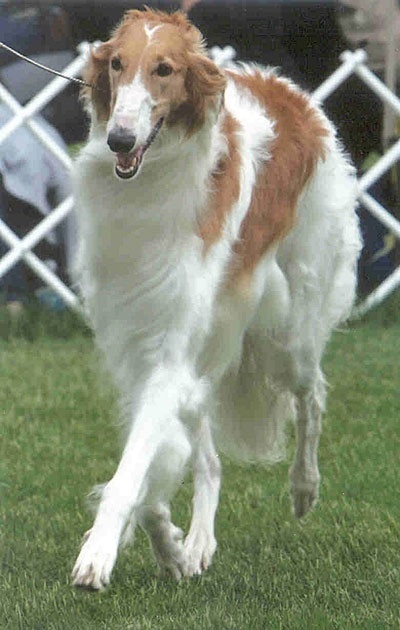 Owner: Kazar Borzoi. Club Specialty and won Award of Merit! Judge Gareth Morgan-Jones; shown by junior handler Emma. 27.05. Am Ch Kazar Rubine (Nina) was Best of Opposite under Judge Frank Sabella at Key City K.C. Minnesota for her first Grand Champion points. 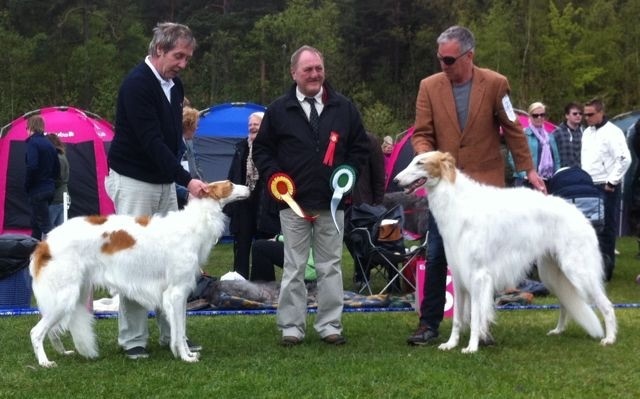 13.05 At the NKC Int Show in Lillesand Kazar Usalka and Ural went BOB and BOS, with CAC and CACIB. They both also gained their Norwegian Champion titles! In Indianhead, Wisconsin K. Rubine went BOS under judge Karen Wilson. A great weekend for her, since she got her US title the day before! 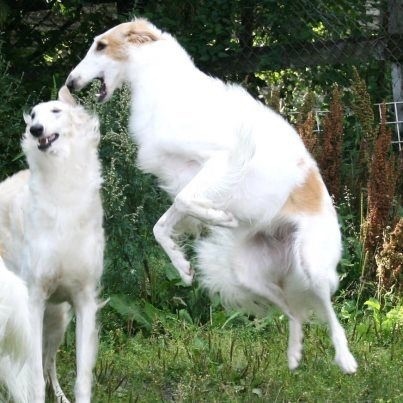 Owner: Melanie Richards, Lythe Borzoi, US. Great news from the U.S.! 28.04. 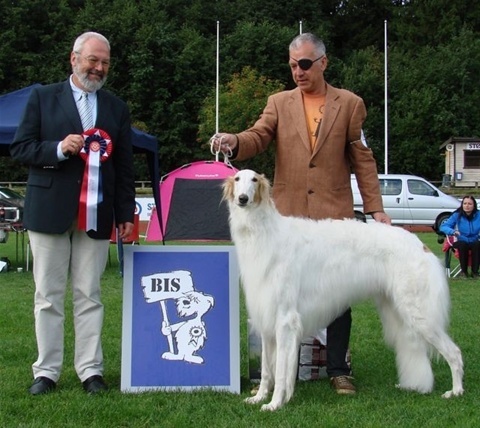 Ch Kazar Umba went BOB at Letohallen near Oslo under judge Eli Marie Klepp. 11-12.02 Nuch Kazar Umba was shown in Letohallen near Oslo (N) last weekend and went Best of Breed both days. Owner: Kristian Nordeng. Judge on Saturday: Christian Jouanchicot,France. Judge on Sunday: Bjørg Foss, Sweden.